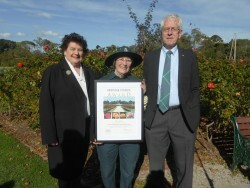 The Heritage Council has presented its award to the Victoria State Rose Garden Supporters. 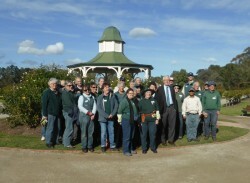 While best known for the mansion and Open Range Zoo, Werribee Park precinct is also home to Victoria State Rose Garden – recognised as a Garden of Excellence by the World Federation of Rose Societies in 2003 – the first in the southern hemisphere and the first run by volunteers. Presenting a framed certificate and cash award, Heritage Council Chair Stuart Macintyre said the Rose Garden would not exist except for the supporters group formed in 1993. Several original members are still involved and Parks presented 10 and 20 year service certificates to 45 members last year. Today the members contribute more than 10,000 hours annually. Stuart said the Rose Garden was fast building its own place in history but also provided a valuable contribution to the Werribee Park heritage precinct by attracting many visitors who were then introduced to the history of the site.